Wisdom might best be defined as “knowing what to do.” In life, we are constantly faced with circumstances in which we have no experience. We are left wondering what in the world we should do. When James writes, “If any man lacks wisdom…” he is not suggesting that only some of us are in circumstances for which we do not have solutions, but that ALL of us are in constant need of wisdom. The word “if” could also be translated as “since.” The question is not really if we need wisdom, but rather how do we get it? Wisdom is received in at least 4 ways. First, wisdom comes from experience. If we touch the hot stove, we have learned not to touch it again. Second, wisdom can be received by listening to those who have gone before us. My children learned not to touch the hot stove, not by burning their fingers, but by heeding the warnings of mom and dad. Third, wisdom can be given supernaturally. One of the gifts of the Spirit, given to the child of God, is the “Word of Wisdom.” We saw it in action in the book of Acts when the church was facing an unfamiliar and perplexing dilemma. The solution is given to James that satisfied all involved and provided a solution to the problem (Acts 6:1-7). Finally, wisdom is also received through prayer. That is the subject of James’ exhortation. Paul reminded the Colossians that all wisdom is hidden in Christ. There is no circumstance which we face that He does not know the best course of action. This wisdom, he says, is hidden in Christ, which requires that we seek Him in order to receive it. We seek that wisdom by taking our situation before the Lord in prayer. “Lord, I am facing this decision and I really do not know what to do. I pray you would show me the right way to navigate through this.” Once we have taken our request to the Lord, we must wait for an answer. This is often where the Christian sways. We forget, while prayer is the way we take our needs to the Lord, His Word is the way He communicates with us. If you want to hear from the Lord, you must crack open the pages of your Bible and read. In addition to daily reading through the Bible, it is a good idea to look up verses that directly target the circumstances you are in and put their teaching into practice in your life. It is through His Word that God will give wisdom to His children. Worship is a very important part in the growth of every Christian. Many times, we measure God in light of the difficulties we are facing. We think there is little, or no hope for us, because our problem seems massive. It is in worship that we are able to see our life in light of the nature of God. We need to magnify God (which does not mean to make Him bigger, but to bring Him into focus) so we see life in light of His great love, mercy and power. As we magnify Him, we will see how little our problem is, compared to His ability. That becomes the source of great peace during trying times. 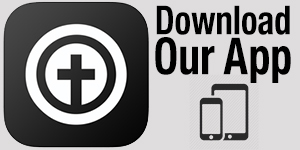 Here, in Hebrews 13, we see a couple of key elements that should be part of the worship life of the believer. First, we are told to offer the sacrifice of praise. Music is an amazing medium. Things that are often difficult to remember, seem to become fixed in our minds when put to song. How many times have you had a song “stuck in your head”, and no matter how hard you try, you cannot seem to get it out? I do not consider myself to be poetic in the least. In fact, I find it difficult to express to God the way I truly feel, but there are so many worship tunes that seem to say what I am feeling. When we gather for corporate worship, and I am able to follow the musicians as they play, I feel like my heart is finally able to express the things I wanted to say to God, but could not find the words. Second, we are told worship must include thanksgiving. Just prior to these verses, we are warned against covetousness. To “covet” is to want what we do not have. It is often driven by failing to be content with what the Lord is currently doing in our lives. The children of Israel were known for grumbling and complaining during their wilderness travels. Instead of looking at what God was doing: providing water from rocks, miraculous food from heaven, a cloud covering from the sun, and a heavenly night-light to lead them, they chose to focus on the things they felt He was neglecting to do. They constantly complained about His provision, and threatened to turn from the Lord every time things got tough. Instead of focusing on the things that do not seem to be going your way, get your eyes on the Lord, and begin to thank Him for all He has done and is doing. Finally, a life of worship, is a life that not only looks up, but also looks out. When we see God as He truly is, we cannot help but develop His heart for others. We are exhorted to include doing good to others, and sharing the things God has given us to benefit them. Worship is not something that is exclusively singing. While song is a great way to express how we feel about Him, it cannot be the only way we express praise. We must express it in actions toward one another. The Levitical Priesthood was composed of singers and musicians, but also included people who set up the tent, made the incense, baked the show bread, and a long list of other requirements, to make corporate worship possible. In God’s economy, those things are as much worship as playing guitar or leading in song. At our church, there are many who worship in the kitchen making coffee, or bring refreshments to make fellowship better. Others worship in the parking lot, assisting people to find a spot, and still others worship by inviting friends and neighbors to hear about Christ. Bitterness is the byproduct of being unwilling to forgive. We are warned against allowing bitterness to take root in our lives, thus springing up and defiling us. Roots, for the most part, are the unseen part of the tree. We understand for a large tree to be able to support itself, its roots must go deep and spread wide. Bitterness begins to develop its root system in us the moment we choose to keep record of wrong, rather than forgive the wrong doings of others. While we are able to continue on for some time unaffected by it, this unforgiveness will soon spring up and bitterness will reveal itself. It seems to me, bitterness may have been one of the chief causes behind Moses’ failure, which kept him from entering the promised land. Scripture records that the children of Israel once again complained about their circumstances in the desert. They were thirsty, and rather than trusting in the provision of God, they looked to Moses and began to complain that their needs were not being met. Moses went to the Lord with the problem and was told to speak to the rock and water would be provided for the people. Instead of speaking to the rock, Moses unleashed his fury on the people, then in his rage he struck the rock. God, in His mercy, provided for the people. However, Moses was disciplined for his disobedience; he was forbidden to enter Canaan. The punishment might seem severe if we do not keep in mind that the spiritual leaders must rightly represent the Lord to the people, or they will develop a wrong view of God. This was not the first time God provided water in the wilderness, He had done it years earlier, and in response, Moses named the place “Meribah” meaning contention. This has always struck me. Moses took a stick, struck a rock and water, enough for two million people, was provided in the desert. Rather than naming the place “God is Awesome” or “Great Provision”, or something else that would forever remind the people of how amazing the Lord is, Moses chose to remember the failure of the people. Now we find him, years later, facing similar circumstances. His unforgiveness has birthed bitterness, and his bitterness springs up as he lashes out in rage against the people. While bitterness is the byproduct of being unwilling to forgive; forgiveness stems from looking at the cross and realizing all that Jesus has forgiven you. The forgiveness of God is complete. Paul wrote, our sins were nailed to the cross never to be brought up again. Forgiveness means to treat someone as though they had never done the thing that hurt you, or that has made it hard to be kind to them. Choosing to forgive is sometimes very difficult, but being unwilling to forgive has much greater consequences. If there is anyone who you are harboring bitterness toward, take some time right now and pray that God would help you to forgive them and treat them as though they had never hurt you in the first place. Do it now before the roots take hold of you. We have arrived at one of the most amazing chapters in all of the Bible. It has been aptly entitled, “The Hall of Faith.” It records incidents from the lives of many Old Testament saints who, in the midst of extreme difficulty, chose to put confidence in the Lord. Whenever we are faced with trying times, we have the choice between trusting in circumstances, emotions, or the eternal Word of God. Another way of looking at it, we can trust in what we see, or in what He says. These men and women chose to put confidence in the Words of God, and by doing so, have obtained a great testimony. We are told, although they have long since died, their lives still speak to us today. They are saying, no matter what you are facing, you can trust the promises of God. Let’s take a moment to admire a few of the influences confidence in God’s promises, brought about in the lives of those who trust in His Word. Over and over again we will read of the fruit of faith. The phrase “by faith…” is repeated 19 times in this chapter. Verse 3 is its first occurrence where we are told, understanding of things we could never grasp on our own, is found by putting confidence in the promises of God. One of the great dilemmas in life is confusion; not knowing how to handle a situation because we have never faced it before. The devil seems to have a field day when we are faced with confusion. He uses it to fill us with fear, anxiety, and even depression. What a joy to know that by faith we can understand the ways of God. The solution in our trying times is to go to the Word of God, locate the promises of God, and cling to Him. Whatever you are facing, there is a promise for that, and that promise along with the Spirit of God will enable you to live a life that will prove to be a good testimony to those who follow. Put your trust in the promises of God today. Years ago I had a friend who worked in a local book store. Part of his job was to be familiar with the books so he could answer questions and make recommendations. The problem was he really did not enjoy reading. His solution was to read the book jackets which often gave a brief summary of the content of each book. While that did not make him an expert by any means, it did give him a good idea of what to expect if and when he ever ventured into reading one of the books. If the Bible contained an inspired summary of its content it would be but one word: Jesus. While the Bible touches on, and even addresses, a wide variety of topics, it is primarily a book about salvation. The Old Testament is filled with promises of a savior coming to provide atonement for sin, and the New Testament tells the story of the Savior. The more you know the pages of your Bible, the more you will know Jesus. He is found on every page and in every story. Sometimes He is the main character of the event, other times He may rest in the shadows in the form of a type or illustration, but He is always is there. As you read the Word, be careful to observe the context so as not to make the Bible say something it does not mean, but also be careful to look for Jesus. As you continue through Hebrews, keep in mind one of the key themes of this letter is that Jesus is better. That is why He is being contrasted with the Old Testament laws, covenant, priesthood and sacrifices. They all served the purpose of pointing to Christ, He serves the purpose of fulfilling the Law and sacrifices. As a result, we no longer live under them, but live in a relationship of grace. Hebrews is dealing with the superiority of Christ. Here in Chapter 9, we see Christ is clearly superior to the Old Testament sacrifices, for they must be offered continually, but He was offered once to take away sin. We are even told, while it is appointed for all men to die once, then to face judgment, Jesus took the penalty on the cross, rescuing all who believe in Him from the judgment to come. In discussing the superiority of Christ, the furnishings of the Tabernacle are listed; we are told they are “copies of heavenly things.” In fact, the Tabernacle and it’s furnishings, become a perfect illustration of the way of salvation. In Exodus, as the Children of Israel are working their way from Egypt to Canaan, God gave them plans for building the Tabernacle. This building would serve the purpose of making a way for man to be in right relationship with God. 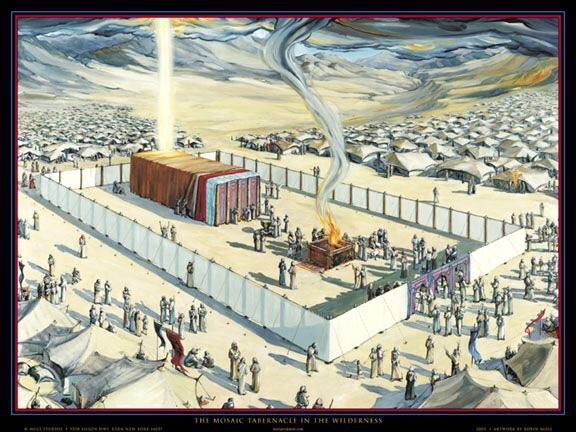 The Tabernacle measured 15’x15’x45′ and was surrounded by a linen fence. Linen is not a durable fencing material. It is safe to say, none of our houses are surrounded by linen fences. The purpose of this fence was to symbolize the holiness of God, reminding the people they could not have access to God. However, on the eastern side of the fence, was an opening large enough for all to enter. Jesus told us, He was the doorway to heaven (John 10:7). Although God is holy and men are sinful, Jesus has provided a way, for any and all who will come to Him, to be forgiven and restored. Once a person walked through the gateway, they would be face to face with the altar of sacrifice. This would remind them they are sinners in need a Savior. Just as the innocent animal was sacrificed for the guilty sinner, so Jesus, the Lamb of God, went to the cross to make a way for us. Right behind the altar was a large basin in which the priests would wash. Paul compared the Bible to water that washes the believer. Jesus told us that after He has cleansed us, we still need to have our feet washed (John 13:10a). The Word of God is the Christian’s cleansing agent. As we walk through this life, we get dirty, the Bible cleanses our mind and refreshes our spirit. Inside the Tabernacle were five important pieces of furniture, each one symbolic of relationship with God. The Lamp-stand shedding its light, was symbolic of the work of the Spirit illuminating the Word, and was of God. The show bread speaks of Jesus as the bread of life, the incense altar is a picture of the prayers of the saints, and the Ark and mercy-seat, of the intimacy of relationship with God. It can be helpful to use the Tabernacle as a roadmap, reminding us of our relationship with God that we now have because of the work of Christ. The High Priest, who alone entered in behind the veil once a year, speaks to us of the access we now have daily, to the very presence of God. Let’s take advantage and spend time with Jesus today. Under the Levitical priesthood, on the Day of Atonement, the High Priest would enter into the Holy of Holies bringing atonement to the Lord on behalf of the people. His job was basically to represent the people to the Lord, and the Lord to the people. If memory serves me, I believe the Latin word for high priest means “bridge builder.” The role of the priest was to make a way for man to be right with God. Hebrews 8 reminds us, Christ is our High Priest and having made a way for us to be right with God, He is in heaven representing us to the Father. As the High priest’s garments were stained red with the blood of the sacrifice, so Christ bears the scars of the cross, as a reminder of the atonement provided at Calvary. When we sin and the devil brings charges against us, our High Priest bridges the gap, perhaps by showing His scarred hands and feet, declaring that the price has been paid, and forgiveness is given. When we are facing trials, obstacles or temptations, and it looks as though we may fail under the pressure of the test, our High Priest stands in the gap and prays for us. Like Aaron and Hur holding up the hands of Moses, Jesus holds up our hands that hang down and strengthens our feeble knees. It is His constant prayer and encouragement that enables us to press through the trials and onward with the Lord. With eyes of love, our High Priests watches our every move. Not because He is hoping we will fail and He might rebuke, correct, and chasten us, but because He loves us as a father loves his son. There is never a moment when we are beyond His gaze. In one of the most magnificent promises in the Bible, we are told He sings over us (Zephaniah 3:17). Imagine the throne room of God, where the songs of the saints accompany the angelic choruses giving praise to Jehovah God. Then a voice rises high above all others and begins to sing a love song, and you are the subject of His song. It is no wonder the writer of Hebrews declares that this is a better covenant.